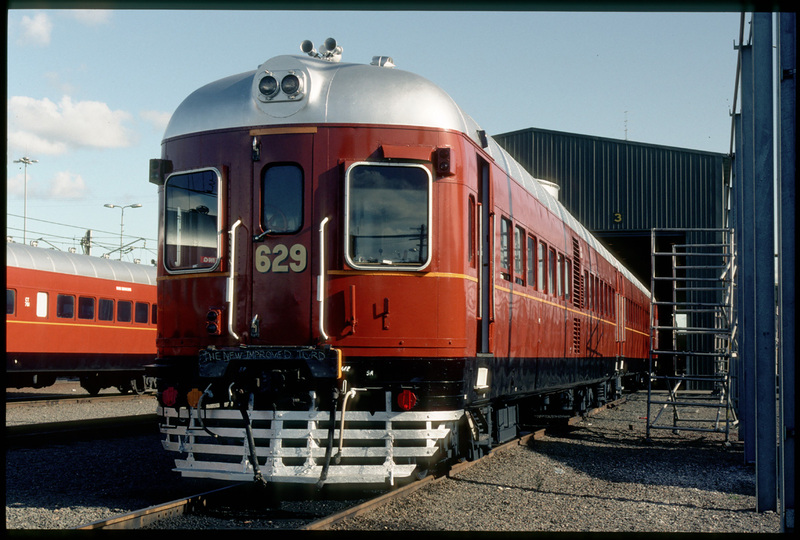 The 620/720 class railcars entered service from 1961 being built at the NSWGR Rollingstock workshop Chullora. Their design was based on the earlier 600/700 class railcars which had successfully replaced many steam hauled services throughout NSW. The construction techniques utilised in the 620/720’s included engineering principles and skills employed by the Chullora workshop for the construction of aircraft components during World War II. Bogies for both power and trailer cars were manufactured by A.E. Goodwin. A total of 18 two car sets were built. Designed for Newcastle suburban area service, Units 621/721 to 625/725 were built as all Second class units and were coded NPF/NTF. The units of the second order, units 626/726 to 629/729 were intended to also be utilised for longer distance services and were built with a first class section in the trailer car, which was hence coded NTC. 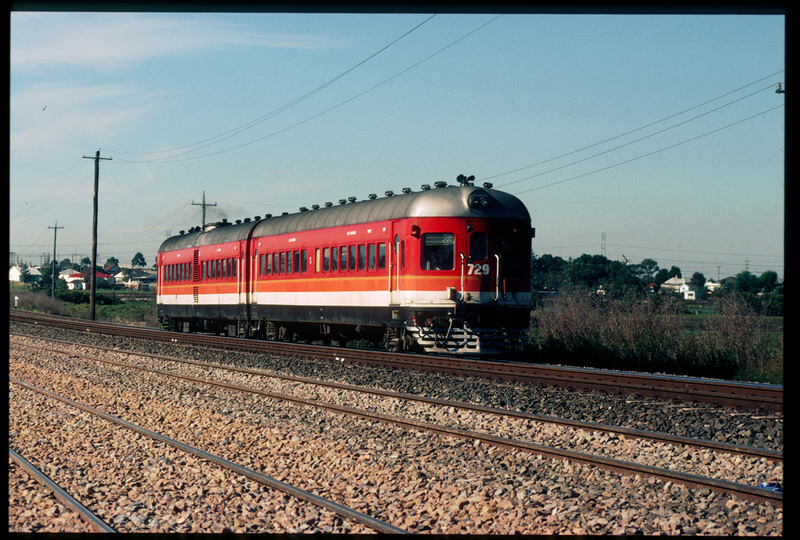 Two further sets, 630/730 and 631/731, intended for outer Sydney suburban working also included the NTC composite trailer. Thes early sets had a 2 ton luggage area position initially in the trailer cars and later relocated to the power cars. Units 632-633/732-733 & 635/735 were constructed with a luggage area to accommodate 4 tons of loading in the power car. 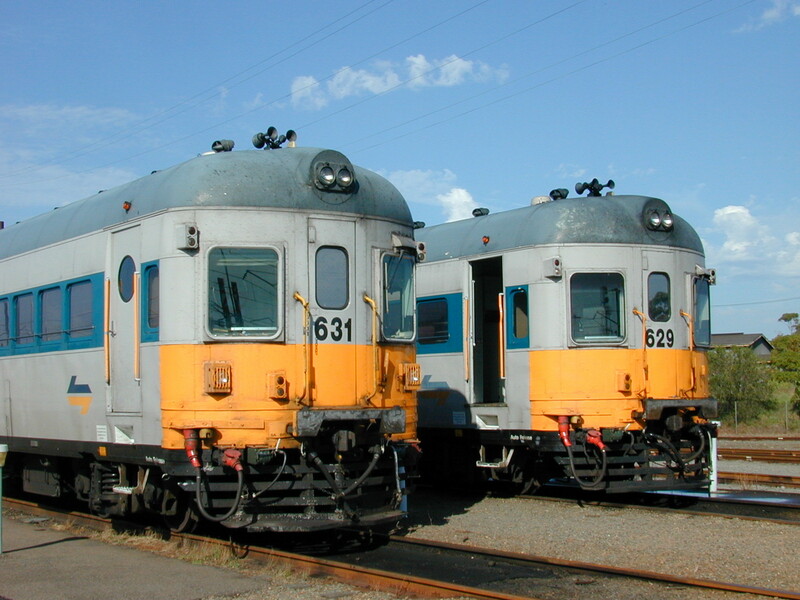 These sets were intended for service in the Goulburn – Cowra – Lithgow area and their unique original configuration could be identified by a blank panel on the power car between the 3rd and 4th side windows. Units 634/734 & 636-637/736-737 were also constructed for country operation intended to replace the remaining steam hauled services in the Dubbo area and allow the transfer of 600/700 sets to other duties. A large luggage area of 7 tons capacity occupied half the power cars and their external appearance differed with a “blank” panel being positioned adjacent to the central radiator compartment. The final set constructed was unit 638/738 which was destined for operation on the Murwillumbah branch. As it was required to haul a parcel van, the unit was built with larger motors and extra fuel capacity but used the same seating and luggage configuration as the early series cars. Several other variations can be noted between car groups construction with other changes also being implemented throughout their careers. The first seven of the 2 car 620/720 sets were built with rectangular windows in the passenger doors like the earlier 600/700 class cars. The remainder of the cars were fitted with circular ‘porthole’ windows in the passenger doors. 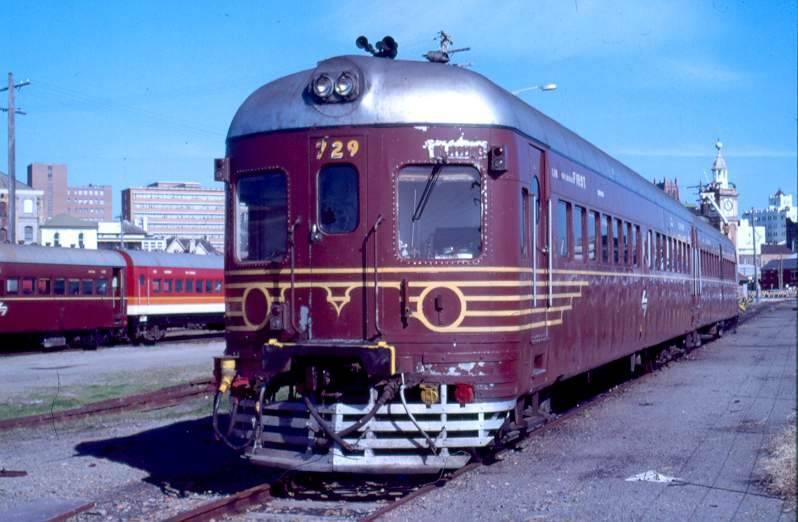 The railcars were originally turned out in an Indian red livery with buff lining on the metal bands above and below the windows, as well as decorative line work at the ends, which carried around onto the lower body panels. The roof was metallic silver/grey in colour and the under gear was black. The car gutter strips were painted black and the end pilots silver. Standard NSWGR shaded lettering was used to denote car number & classification, smoking or non smoking designation and seating class allocations on each car side. The car number was also shown at the top of the end doors. Handrails fitted to the cars were polished aluminium, except for those on the car ends, which were painted in the body colour. Between 1969 and 1971, the all Second class NTF trailers were converted to composite NTC type, and around this time the livery was simplified on all cars by omitting the buff line above the windows. From 1980, four 620/720 sets were painted in the yellow ended ‘Reverse’ livery with sets 625/725 & 637/737 also having a yellow band applied along the lower section of the car. In 1982 the ‘Candy’ colour scheme was introduced which consisted of a bright red body, with broad white and orange stripes along the lower body side, and a thin yellow stripe separating the red from the orange. Bright silver was applied to the roof roof and pilot, and the underside, running gear and the bottom of the lower body panels was painted black. All handrails and lettering were painted white. In January 1985 629/729 were painted this way. The fitting of reinforced glass windscreens for the driver/guards cab position windows which projected beyond the body line significantly altered the cars appearance and were hence referred to by some as “Bug eyes”. By 1993 the Newcastle based sets were repainted into a "heritage" brown livery intended as an economic way to improve fleet presentation. The final livery they carried was the Cityrail grey and blue which was applied around year 2000. The final six operating sets progressively began to enter storage during 2007 as new Hunter rail cars were introduced into service. The last day of revenue service for the 620/720 railcars was on June 2nd 2007 with the mismatched set 621/725 performing the final run to Dungog. An "official" last run with invited guests and media on board was made to Paterson on Monday 29th October 2007. From this time the six remaining sets were officially stored out of service with RailCorp announcing that 2 sets were to be kept for inclusion in the RailCorp heritage core collection. Set 621/721 was subsequently allocated to The Rail Motor Society at Paterson whilst set 623/723 was allocated to the NSWRTM. In June 2008 Railcorp called tenders for the sale of the four remaining 2 car sets as well as damaged trailer car 728 and some spare components. Goodwin Alco Pty Ltd submitted an offer to purchase 629/729 in early July and in November 2008 was notified that it had been selected as the preferred tenderer. Having purchased 629/729, restoration of 629/729 has now commenced to prepare it for the next stage of its operational career. Regular updates on the restoration can be found here .